After photos were taken 8 months after the procedure. 16th and 18th of October 2007 at the Radisson Edwardian Grafton Hotel, 130 Tottenham Court Road, London W1T 5AY. The hotel is conveniently situated next to Warren Street Underground station on the Victoria and Northern lines. If you will be travelling from the North of England, the hotel is very close to both Euston and King Cross mainline stations. Presentation of HDC results that will show you what to expect from your possible potential procedure. I think the photographic representations by HDC are constantly appalling. They never learn! The before is wet; the after dry. 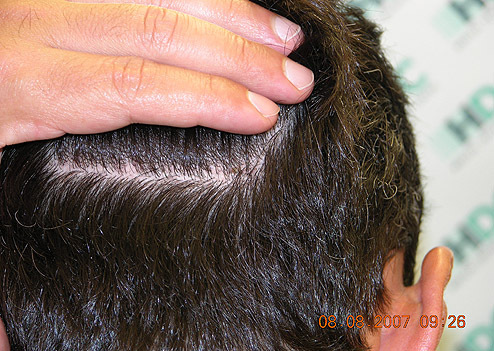 The hairline only was transplanted and yet the impression is of a GREAT deal of additional fullness throughout. There are only portrait shots and no birdseye view. This is an endless roll of the same kind of inadequate presentations by the clinic. They have been asked so many times to give a true and representative record and they just never listen. I think he’s looking great. Kudos and enjoy that hair! I think he looks very good, I am just surprised that he didn’t have shock loss. » deal of additional fullness throughout. Just for correct information, the transplanted area goes far beyond the hairline and well back into the sides. About 1200 grafts were used for the hairline and front 2cm area and the rest 1400 grafts, were placed on the sides and further back. As we have promised in a previous post, we have more results to post to this forum. We also have an interesting result that we are preparing which shows beard restoration. Someone commented in the past that most of our results show hair enrichment. It is the case that most of our leads are people who are not in stages of Norwood 5-7, but mainly in stages 2-4. Nevertheless we have plenty of results in our website of stages 5-6. In fact we have one case in stage 6 that we will post soon. 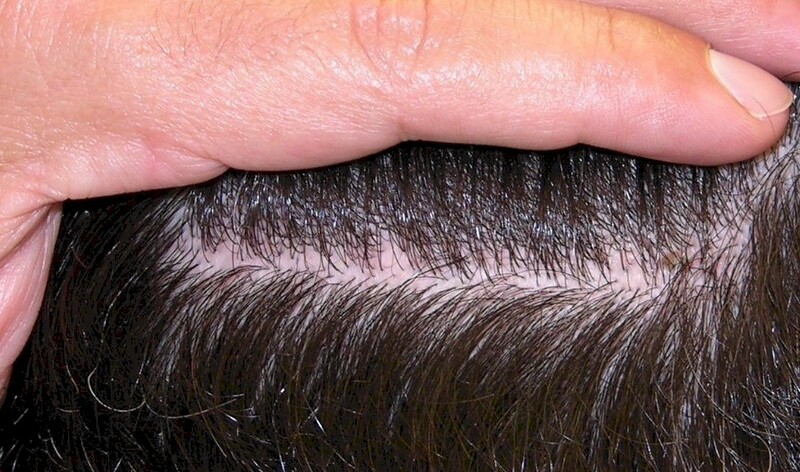 In addition we can say that adding hair into existing hair needs more skill and care to avoid shock loss and also to give a good result, because most of the times the expectations of those patients are higher than Norwood 6 patients. Before pictures WET HAIR and head at a tilted angle to show everyone the severity of the thinning. After pictures DRY hair and head not tilted at the same angle. Additionally, in the before shots the lighting is brighter. In the after shots it’s darker. When you do this it is NOT the same and everyone knows it’s not the same. This man’s hair when DRY undoubtedly appears MUCH thicker than when wet. Everyone’s does including mine. I can go right now and wet my hair, take pictures, then dry my hair and take pictures (maybe even put gel in it to add more volume) and post them and the readers would think I have had some magical transformation. Post AFTER pictures of the head WET and tilted down looking at the TOP from above with the HAIR WET, and with the same lighting! Also, why don’t you take the BEFORE shots WET and DRY so that we can see just how much fuller his hair already looked before the procedure when dry? Only then will the readers get and ACCURATE perception of the difference. It’d be nice to see hairline work on clean bald scalp sometime. Why won’t this clinic provide the readers pictures like the scenario I describe in my above post? I don’t think myself or other readers are asking for anything unreasonable or without merit. Will you please give the readers your opinion on this issue because many have requested pictures such as I describe to no avail. Unless the clinic provides this type of information I think you’ll agree readers cannot truley get an accurate representation of the true results. » severity of the thinning. » After pictures DRY hair and head not tilted at the same angle. » When you do this it is NOT the same and everyone knows it’s not the same. » This man’s hair when DRY undoubtedly appears MUCH thicker than when wet. » from above with the HAIR WET, and with the same lighting! » Only then will the readers get and ACCURATE perception of the difference. it’s scary there are so many retards on this site, do you really think that this guy could just dry his hair, fluff it up and voila, a full head of hair appears in the after pic!!? It’s pretty clear he is receeding, all you need to do is to look at where they placed the grafts. HDC actually has the best quality pics I have seen, far better than Woods and Umar. Woods never gives a damn about lighting and angles and Umar rarely shows noticeable growth in his pics, funny that I dont see people whining about that. Exactly my point, the before shot is wet but you can still get a pretty good idea how much thinning he has, there is no way the before and after difference is due to wet/dry hair, gimme a frigg’n break! Yeah the after pic looks good. But why do you guys hang everything on just pics on internet? Would you just book a ht from this alone? Videos are the next best thing to seeing it live. So why not demand this? » next best thing to seeing it live. So why not demand this? Well said, who cares about the dry hair pics, let’s see a video of his hair. HDC has posted more patient results on a routine basis than most other clinics. They do not need to resort to any deceptive practices to entice the audience. You can refer to the patients log and see for yourself. If we are to be excruciating with our criticisms, then let’s be fair and subject ALL doctors and clinics to the same level of scrutiny. I don’t see that being done by the posters on this thread. The improvement in this case is obvious. It’s not hard to see. This is good work for 2600 grafts. Also, I want to stress once again that all clinics and doctors should make an effort to post videos along with still images for both BEFORE and AFTER results. This is the preferred way to showcase your results and to avoid unjust criticisms. It is for your own protection. Was the first picture in this photo the actual before picture of this hair DRY BEFORE his procedure? If it was then that is fine, but if it was why did the clinic not post it as such? » DRY BEFORE his procedure? It was my fault. HDC emailed me all the pics. They were of different sizes and I didn’t want to spend too much time resizing them so I only posted the ones that are more or less the same size when I started the thread. I was emailed individual pics, I had to piece them together for the side by side comparison. I picked the ones that were the easiest to work with. HDC do good work. I am sure there is little debate about that but there is a real problem with their presentations. So many people have been duped by the HT industry in the past into getting surgeries having got inspired by great looking pics that were deceptive and with that kind of history in the industry the requirement to present good pics is part of the territory. A clinic must surely appreciate that. The back / crown area does look much fuller and it was not touched during the surgery. HDC has had this problem before and I believe that they are not trying to deceive but they do like this kind of portrait / advertisement shots. If they would just take this issue seriously then the good work that they do would be more evident. Here is a message for HDC. We may spend E20,000 or more on surgery with you and before and after pics are at least part of the system that encourages us to give that money to you so we have an absolute right to demand representative pics anything less is deceptive whether intended or not.